The interstellar space is mostly empty. Every now and then however, a gigantic cloud of dust and gas, a so-called Giant Molecular Cloud, is formed, usually in a spiral arm of the Galaxy. These GMC's contain enough material to build thousands of stars like our Sun. Through a poorly understood process, parts of the GMC collapse as gravity overwhelms the internal pressures. The GMC fragments into ever smaller pieces culminating in the formation of individual stars which may remain loosely bound to one another by gravity. These structures appear to us as Open Star Clusters. The fate of these clusters is to be torn apart by the tidal pull of other large GMCs as they orbit about the center of the Galaxy. Although a few of them will survive as long as a few billion years, at least, most of them will be dispersed faster. Nevertheless, they survive long enough for the more massive stars to complete their thermonuclear evolution, passing into the stellar graveyard of white dwarfs. Open clusters are important because they provide a tool to study the formation and evolution of Galactic stellar populations. 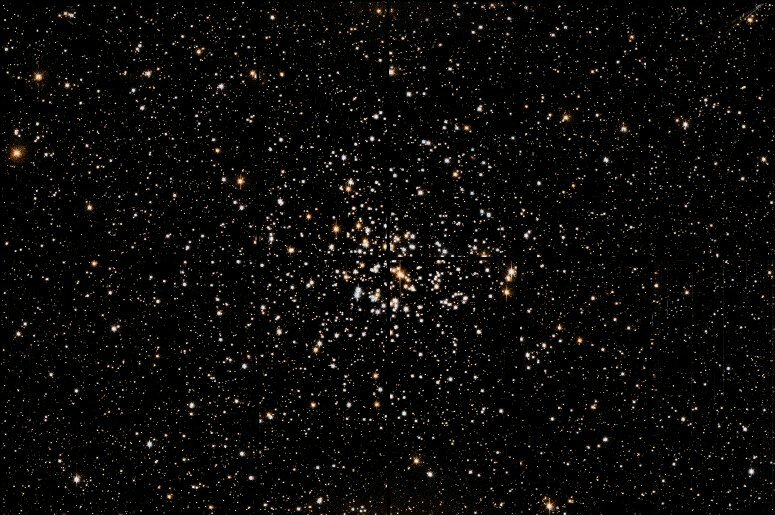 The stars within a single cluster formed at the same time and under the same conditions, allowing the astronomer to reliably determine the cluster age. Since clusters are both forming and dissolving at the present time, it is possible to use the population of clusters to develop a fairly complete picture of the life-cycle of the clusters and the stars they contain. An analogy is to consider the human population in a large school complex offering classes from kindergarten to 12th grade, where even a brief study would be sufficent for a trained scientist to fully characterize the development of the human species from early childhood through to adulthood. This week's image presents NGC 2099, also known as Messier 37, a rich open cluster located about 5000 light years away, in the constellation Auriga. The cluster, containing about 2000 stars, was imaged with the CFH12K mosaic camera in October 1999. It is a member of a carefully selected sample of open clusters, spanning a range of ages from about 1 to 5 billion years old. This sample was selected so that the Astronomers could study the white dwarf population. White dwarfs are the most common kind of star in the Galaxy. All stars whose initial mass is up to about 5 times that of the sun will end up as white dwarfs once the nuclear energy stores are depleted. It is the fate of the sun. However, many chapters the white dwarf story remain to be written, mainly because these earth-sized, very dense balls of carbon and oxygen are exceedingly faint and therefore difficult to study. 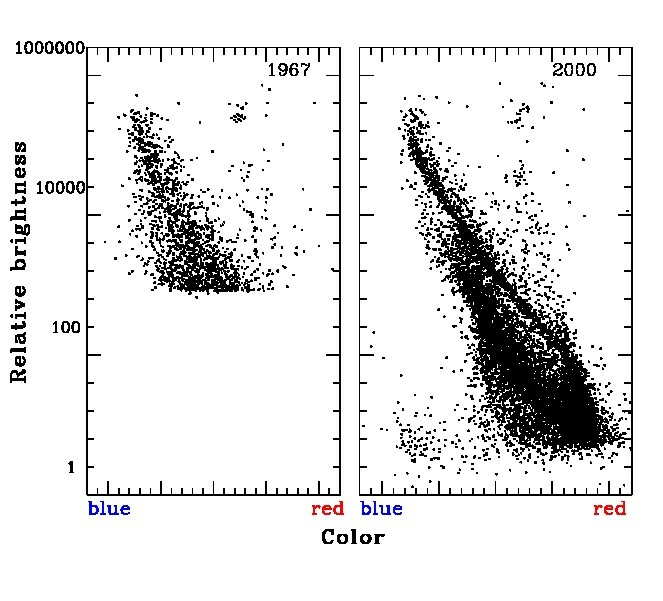 An important tool for studying open clusters is the colour-magnitude diagram; essentially a plot of the relationship between the surface temperature and the apparent brightness of a star. Since the members of an open cluster are all at the same distance, they will define very tight sequences in a color-magnitude diagram. The diagram for NGC 2099 can be viewed here. The left panel shows the existing data before the recent study. The author's recent work is shown in the right panel. The stars belonging to the cluster lie along the thin diagonal sequence seen in the upper part of the figure, it is especially clear in the right panel. Most of the remaining stars are located elsewhere in our Galaxy, at a different distance than the cluster but along the same direction. In the lower left a handful of points mark the presence of the cluster white dwarfs; the wheat amongst all the chaff for this study. This two-color picture of NGC 2099 was created from separate five minute exposures at blue and yellow wavelengths using the CFHT12K camera at the Canada-France-Hawaii Telescope. The complete field of view is 28 by 42 minutes of arc. The wide field of view is a key feature of the CFH12K and is an important factor making the comprehensive survey of relatively nearby Open Clusters a feasible program.